Happy April Fools Day from Pixar! This is awesome. We already featured one fantastically brilliant April Fools joke-turned-promo today (this Pineapple Express 2 teaser) but here's another one that earns a top spot. Pixar's Monsters University viral website, designed to be a fully operational university website, has been defaced today by the rival school "Fear Tech". Similar to the way the Joker suddenly defaced all The Dark Knight viral websites back in 2008, the site has spray paint all over and the color theme was changed to orange. It's a hilarious April Fools rivalry joke that works brilliantly in the context of this MU viral site. 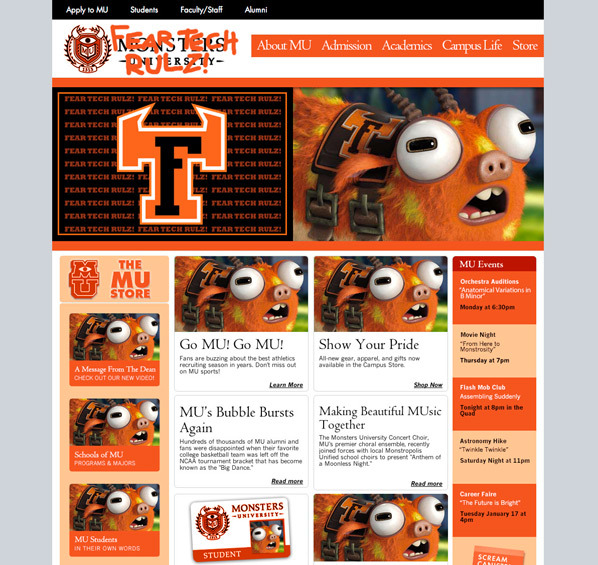 Click on the screenshot below to visit the MU.com/edu site and it'll update with the Fear Tech defacing once it loads. 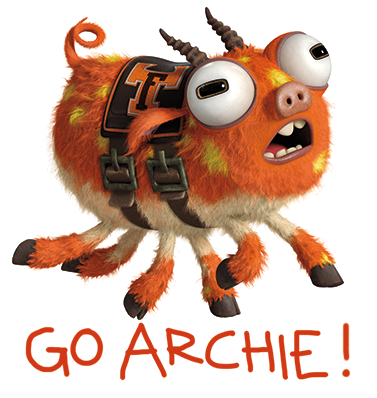 The more you try to click on the page, it pops up with more Fear Tech "scare pig" mascot stickers. This is just a perfectly planned and fun little April Fools Day joke to keep the buzz rampant for Monsters University. I still can't wait to see this new Pixar prequel, and I love all the marketing they've done so far. A look at the relationship between monsters Mike (voiced by Billy Crystal) and Sulley (voiced by John Goodman) during their days at the University of Fear -- when they weren't necessarily the best of friends. Pixar's Monsters University is being directed by Dan Scanlon, who went from animator to storyboard artist to writer to co-director on Mater and the Ghostlight, making his feature directorial debut. This is a prequel to Pixar's animated movie Monsters Inc, originally released in November 2001. Disney/Pixar has Monsters University set to arrive in Disney Digital 3D everywhere starting June 21st this summer. Visit: MU.com.